New Years Eve will soon be upon us and now is the time to start looking for all of your New Years Eve Party Decorations ready for an amazing New Years Eve Party. We have lots of New Years Eve 2018 Novelties such as glassses and headboppers which are perfect for any New Years Eve Party Themes and look cool. New Years Eve Party Hats are always a popular choice and we have a large selection all of which are ideal for parties at home or in restaurants, clubs and bars. We would love to know how you are celebrating New Years Eve this year. 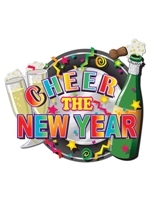 Thoughts are now turning towards celebrating New Year and we have lots of new and exciting New Years Eve Party Products for you to choose from. Whether you are having a big or small New Years Eve Party or want New Year Decorations and Accessories for a restaurant or pub our fantastic range is perfect and we have lots of New Years Eve Party ideas for you. For a smart fun look you could theme your party either black and gold or black and silver or you could go for a vivid and colourful look. We also have a fun variety of 2018 Novelties, perfect to hand out as Midnight approaches. New Years Eve Decorations add fantastic atmosphere to any New Year Party and a Happy New Year Sign Banner and a Giant Banner really stands out and welcomes your guests. Foil Happy New Year Cutouts, Hi-Gloss Foil New Year Sign and Metallic Tassle Garlands are vivid and a 2018 Cutout Sign and 2018 Danglers are in perfect keeping with New Year. Create memories of the night with New Year Photo Signs which are always good fun. New Years Eve Party Packs are always a popular choice and we loads of themes, colours and pack sizes available, for example the New Yorker Pack is for Ten people and the Tuxedo Nite Pack is for Fifty people. New Years Eve Hats are also available in packs such as the Neon Party New Year Top Hat for Twenty Five people as are New Year Tiaras which include Happy New Year Sparkling Glittered Tiaras in Black and Gold for Twenty Five people. New Years Eve Party Accessories are a must and get everyone in the party spirit and 2018 Glittered Cardboard Glasses, Glittered New Year Hat Glasses, Gold Happy New Year Glasses and a Happy New Year Star Headbopper are impressive options. Do not forget the all important New Years Eve party stuff for midnight, make some noise to see 2018 in with Blowouts and Party Poppers. Now is the time to buy all of your New Years Eve party supplies and take advantage of our delivery options so you are ready for an amazing New Year. How are you spending New Years Eve? We would love to hear about how you are seeing in 2018.